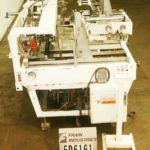 McDowell Model EL500 (2) piece HSC case erector, sealer, lidder rated from 5 to 20 cases per minute – depending on material and application. Case size range. (knock down) 8" to 40" in Length; 10" to 31" in Height and minimum minor flap width of 5". Unit erects flat HSC cases from hopper, seals bottom flaps with hot glue adhesive and transfers erected case into lidding station, single case ready for filling with product.